Britain is home to some of the best music festivals in the world. From Glastonbury, to T in the Park, to the Reading Festival, there are in fact hundreds to choose from with more being added each year. Glastonbury is considered the daddy of all British music festivals. The first Glastonbury festival was held in 1970, the day after Jimi Hendrix died. Attendance at the first Glastonbury festival was a mere 1500 people compared with the 170,000 who now journey to Worthy Farm in Pilton each year. The four day festival attracts the biggest names in music, which is why tickets usually sell out within a matter of hours. Attendees who do manage to get their hands on tickets can usually expect some rain and mud and the musical experience of a lifetime. The Green Man Festival is set in one of Britain’s most stunning National Parks. Green Man recently claimed the title of Best Medium Sized Festival with music ranging from folk and dance to indie and psychedelic. The first Green Man Festival was held in 2003 to a mere 300 people and now attracts 10,000 festival goers each year. Expect all night bonfires, plenty of vegetarian cuisine and one of the best festival atmospheres with a chilled out crowd. Reading is another huge annual music festival that should be in any music lover’s calendar. The Reading and Leeds music festival takes place on the August bank holiday and attracts around 80,000 people to the Reading site and 70,000 to Leeds. This three day festival attracts the best rock and indie artists and tickets are usually sold out within hours. Nirvana and The Stone Roses have both played at Reading. The crowd can get nasty though and do have a reputation for bottling acts such as Bonnie Tyler and the Plain White T’s off the stage. Scotland’s largest music festival attracts around 85,000 people over its three days. T in the Park takes place in June every year and tickets for this festival are like gold dust; tickets for 2010 sold out within 90 minutes. Attendees can expect some of the biggest names in rock, indie and pop. 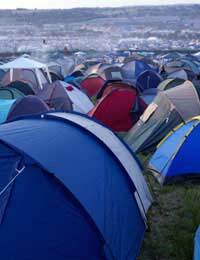 There are seven main music stages at this festival and camping is provided for those who wish to attend overnight. Expect plenty of sunshine and great music but as this is Scotland attendees should pack some wet weather gear. One of Britain’s most famous blues festivals takes place every year in Dundee during July. This three day festival attracts visitors from around the globe and features world famous names such as Lil’ Jimmy Reed and Mud Morganfield, son of the legendary Muddy Waters. The Dundee Blues Bonanza hosts over 150 acts in more than 30 venues across the city. Music workshops and jams are also held during the blues weekend. The good news for blues lovers is that the Dundee Blues Bonanza is free and always has been since it originated in 1994. Radio 1’s Big Weekend is a music festival with a difference. The Big Weekend is held once a year and always at a different location. Crowds at the Big Weekend are mammoth; the event attracted over half a million attendees at Falkirk in 1999. The Big Weekend is organised by Radio 1 and tickets are free and obtained through a lottery. The Big Weekend attracts the best in pop, rock and alternative and has grown to be the biggest free music festival in Europe. The Larmer Tree Festival advertises itself as the best kept secret in music festivals but still manages to attract over 4000 people per day. Featuring 80 artists over six stages, a comedy club and 150 free workshops the Larmer Tree Festival is diverse. Voted the Best UK Family Festival in 2008, attendees can expect world music in beautiful surroundings. The Larmer Tree Festival takes place every year in July and tickets have been sold out for the last 16 years. The Big H Music Festival is a newcomer on the Scottish festival scene and features two days of non stop music from 75 bands across three stages. The Big H donates all funds to Talking 2 Minds, Help 4 Heroes and Poppy Scotland. Taking place on the 10th to 12th June the Big H organisers hope to raise more than £500,000 for charity with a crowd of 55,000. Festival attendees can expect a diverse range of acts such as Suspire, the Cundeez, Havoc and Pariah, a band guaranteed to set the crowd on fire.